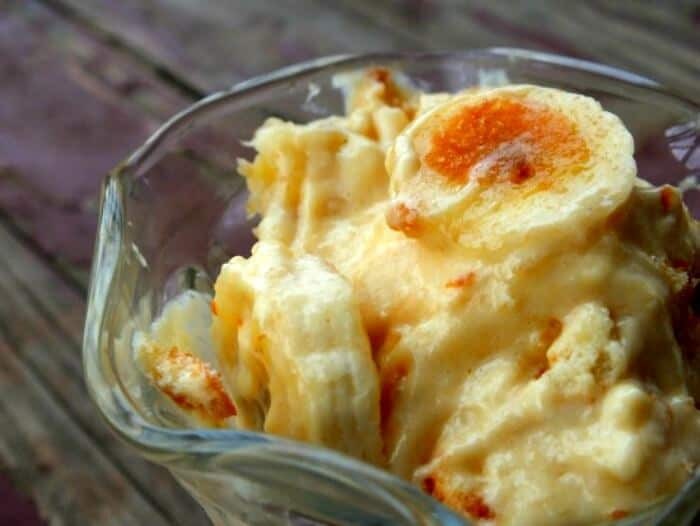 This old fashioned banana pudding recipe is homemade from scratch – none of that boxed pudding mix stuff, thank you very much! Lots of bananas, rich and creamy homemade pudding, and a serious amount of ‘Nilla Wafers make this a family favorite dessert for a reason! Banana pudding finds its way to nearly every Texas table around just about any holiday. As long as a glazed ham, some hot out of the oven rolls, and a creamy rich banana pudding are on the table it doesn’t much matter what else fills it out. Some people (and I hate to say it but even some Texas people) use boxed, artificially flavored banana or vanilla instant pudding in this classic treat. These people need to be smacked across the hand with a whisk for contributing to the demise of good food. There is no reason not to make it from scratch, especially if you use a microwave. The flavor is clearer, more intense, and the texture is way better. An old fashioned secret to really rich puddings is evaporated milk. I have tried half and half, heavy cream, whole milk, and combinations of those ingredients and nothing makes a pudding creamier than evaporated milk. You can substitute 3 cups of milk if you want to – but I am telling you the evaporated milk works best. I use ‘Nilla wafers, really ripe bananas, and a classic custard for my homemade banana pudding but I add a twist that makes it light and fluffy, too. Banana pudding my way is a layered dessert more than just a pudding. ‘Nilla wafers are placed in a layer at the bottom of a bowl, then the banana is sliced over the top. You then add a thick layer of pudding and repeat the layers about three times, or until the pudding is gone. Just make sure you are finishing with the pudding. So, what’s my twist? I whip the egg whites up into a stiff, sweetened meringue and then carefully fold it into the cooled custard right before putting it all together. You end up with a lighter mouth feel with all the flavor and deliciousness of the pudding. Kinda likee a mousse. Try it that way once and if you don’t like it just use the meringue as a topping next time instead of folding it in. You can certainly serve it just as soon as you are finished with the layering but if you make it a day ahead the cookies soak up all of the flavor. We like it both ways – and I like it served room temperature or slightly warm from cooking while my husband prefers it ice cold. Old fashioned, homemade banana pudding recipes are hard to improve on. Creamy vanilla custard, sweet bananas, and crunchy vanilla wafers are layered to make a home-style, comforting dessert. In this version I add stiffly beaten egg whites to the custard to give it a bit more lightness. Mix together sugar, flour, and cornstarch. Slowly add milk, whisking until well blended. Microwave on high for about nine minutes until the mixture thickens, whisking every few minutes. Add a little of the hot mixture to the egg yolks, whisking constantly. Add the yolks back into the pudding, whisking constantly to keep the eggs from curdling. Put back into the microwave and cook for 2 more minutes, whisking a couple of times. Remove from heat and add the butter. Whisk until it is mixed well. Meanwhile, mix the cream of tartar and egg whites in the bowl of a mixer. Beat until soft peaks form. Slowly add the sugar while beating and beat until they are glossy and thick. Add 1/3 of the egg whites into the pudding and fold in gently. Add the remaining egg whites and fold in thoroughly until the two mixtures are completely mixed. Starting with the pudding, add a layer to the bottom of the serving dish. Add more pudding and repeat the layers, ending with the pudding. Sprinkle the top with cookie crumbs before serving. I like to sprinkle sugar on banana slices and caramelize them with a torch to add to the top before serving, too. One of my favorites! I have zero control around banana pudding. I love that you made it from scratch, that’s my preferred way too. Would it be too corny to say that I’m bananas over your banana pudding?! I’m now dying for this! I have some fabulous ginger cookies that would work well with this! I think tomorrow is the day 😉 Pinning – yum! This looks amazing! 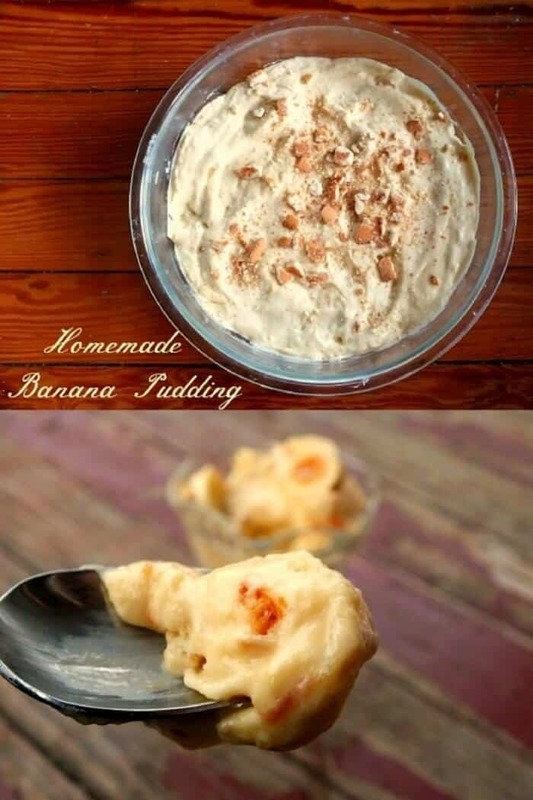 I love bananas and I love bread pudding so I don’t see how I could wrong with this recipe! 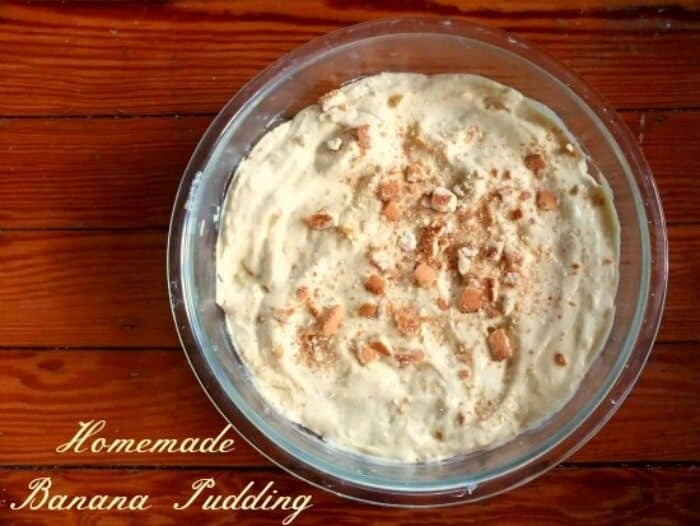 Love homemade banana pudding Marye, this looks incredible! That’s my childhood right there in that bowl. Great memories happy to have your recipe. Thanks Michelle! I love it! Such a lovely breakfast idea! This looks SO delicious! Banana pudding is always a favorite! easily, one of my all time favorite dessert! and of course homemade is always best!! Totally! I love this stuff! I’m a huge bake from scratch person and have been wanting to try real banana pudding lately. So much better than boxed! I haven’t had banana pudding for a long time. But this recipe is inspiring me to make one! Looks scrumptious! You should. It’s so good! I loooooove warm, homemade banana pudding. Like – too much. It kind of brings me to tears a little, it’s so good. I’m totally digging those caramelized banana slices. I need some. Like, NOW. I totally get it… It’s so good. So much yum! I heart banana pudding and vanilla wafers. This looks super yummy! Thanks! It’s a favorite here. I love this recipe! I rarely use the microwave, so I just cooked it stovetop like a regular pudding, low and slow! Thanks Marye! It doesn’t get better than banana pudding that is made from scratch! Yum! Never knew I could make my own banana pudding with out the help of a box. Totally need to make this for my kiddos. They would love it! Pinned! Can you believe I’ve never made banana pudding? haha It’s a shame isn’t it? I need to change that and I will start with your awesome looking recipe!! Love classic recipes like this! This banana pudding would go fast here! I have a recipe for Nilla wafers.. I should post it!